Choosing a follow-up single to a massive hit is a decision always fraught with danger. As a man who spends way too much time thinking about what singles should be released from an album (and in what order), some of the choices made by record labels, or the acts themselves, can be a little askew to say the least. In 1986 Bananarama were in the position of just having had an absolute juggernaut of a hit single with Venus. Not only a sizeable top 10 hit in the UK, it reached the no.1 spot in the US, something they never quite managed at home. A Hi-NRG reworking of Shocking Blue‘s 1970 hit, it was famously produced by Stock Aitken and Waterman and is, of course, an absolute classic. That said, the album it was featured on, True Confessions, was a transitional record for the band. Most of the album sounds nothing like Venus, having much more of a similarlity to their early post-punk, new wave girl group aesthetic, albeit with a mid 80s production sheen – so the choice of a second single became a problematic one. What to do? Well, lurking at the tail end of the album was another S/A/W production, More Than Physical – surely the obvious choice for a follow-up. However, on the album it’s an oddly low-key dance-pop affair driven by a propulsive synth bassline, and not a blockbuster second single choice by any stretch of the imagination. What’s more its runtime is 5:06 – that’s an eternity in pop. In many ways it’s atypical S/A/W – a rather strange song, with softly immersive harmonies in the chorus (well, the three of them singing the same words at the same time, in classic ‘rams style), and a rather insistent lyric. I love it dearly. However, it isn’t Venus, and the chance to recreate the success of that song led to More Than Physical being remixed for a single release. Ah, the remix – in its original 80s incarnation, it was an opportunity to streamline potential singles for radio play. By the time we had got to the mid 90s, it tended to be five versions of the same song re-worked by different producers (hello maxi-single! ), and these days it tends to start and end with a guest rap by Nicki Minaj. But in the 80s and early 90s it wasn’t uncommon for songs to be re-worked entirely and some songs we class today as the definitive versions, are in fact remixes (go check out the original album versions of The Reflex by Duran Duran and Missing by Everything But The Girl, as good examples). More Than Physical got a Hi-NRG makeover in line with the sound that proved so successful for Venus. With newly recorded vocals, it became an entirely different beast. The longing of the original becomes a more demanding, sexualised anthem, with repeated refrains of ‘deep down’, ‘hey boy’ and ‘ooh ooh ooh yeah’ leaving little to the imagination. It’s not as immediate as Venus but it was ahead of its time, sounding more like an early 90s song than your typical mid 80s affair. I’ve always loved Bananarama for the fact they seemed as surprised as anybody that they were pop stars. They are also one of the few bands whose choreography I can perform to a professional standard. And in this video they appear supremely confident: flushed with the success of Venus, it’s the look and sound of a band excited by future possibilities. It’s also great to see Siobhan really enaged with the record. Sadly, as the promotion for the fully S/A/W produced follow-up album WOW! continued, her unhappiness at the direction the band was taking had become obvious. The rest of course is history (I apologise for the almost pun). However, the single failed to gain momentum, stalling at no.41 on the UK singles chart and in the process becoming one of their least known singles during what was a golden period of success for the band. Its chart failure is something of a mystery. Keren was pregnant at the time which clearly impacted on the promotion campaign, but the record label was hardly supportive either. Maybe the opportunity to record a whole album with S/A/W had grabbed the attention of the men in suits, and the impression given was that everyone wanted to wrap up the True Confessions era with the utmost haste. 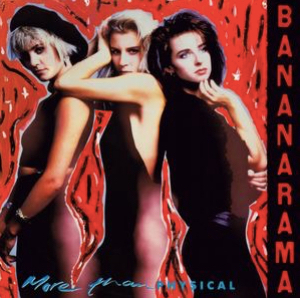 Sadly, More Than Physical doesn’t appear on any of the official Bananarama greatest hits albums, and following an extensive survey of my friends at the pub the other evening, it is all but forgotten in the public consciousness. More Than Physical deserves to be remembered though – it’s a pivotal song in the band’s long career and a precursor to the sound of much of their later output. Who could sing this today and have a hit? In my mind this is already featured on Sarah Whatmore’s comeback album. I agree with the choice, this is classic Bananarama, but I personally think the album version is far superior.